A seductive combination of style and exclusivity, the 86 Yacht delivers on all fronts. From bow to stern, every detail has been crafted to perfection. Inside, the main saloon is a large welcoming space; full of natural light, hand-finished furnishings and state-of-the-art technology. The outstanding level of design and craftsmanship continues below deck, where both the owner’s stateroom and guest cabins offer privacy and extravagance in equal measure. Enterprise was built by Sunseeker in United Kingdom at their Poole, Dorset shipyard . Her elegant exterior and interior styling are the work of Sunseeker, who is also responsible for her engineering. Enterprise’s interior configuration has been designed to comfortably accommodate up to 8 guests overnight in 4 cabins. 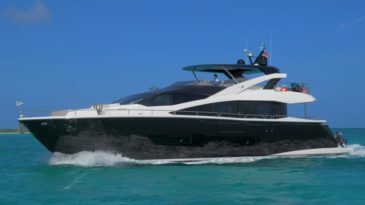 She is also capable of carrying up to 4 crew onboard to ensure a relaxed luxury yacht experience.